Hello all, and happy feast of St. Dominic! As you might imagine, this is a huge feast for the Dominican order. Our guy was well known for his preaching, making it his mission in life to convert believers out of the Albigensian heresy. As a younger Catholic, I didn't know much about St. Dominic. I had an image in my mind of someone who was kind of loud :) and unafraid of confrontation for the greater good of saving souls. Being someone who has always shied away from confrontation, I didn't relate to him very much. As my faith deepened in my 20's, I came to understand a lot more about St. Dominic. About his humility and holiness, and deep love for Our Blessed Mother and the rosary. I wrote about my experience becoming a Third Order Dominican, and learning how "Order of Preachers" can apply to even the most reserved among us. :) Check it out! Mike finds this emotion designation very amusing :) and what I mean by this is that the person is obviously feeling less than 100%, perhaps struggling a bit physically and/or emotionally. I remember back when I started this blog, I wanted the title to be simpler. The Catholic Librarian, you know. ;-) But the domain I wanted was already taken. Imagine that. ANOTHER Catholic Librarian out there, the nerve! So I stuck the "life of" in there, and I have to say, I'm glad that I did that. Because this *is* very much a "life blog." I don't often talk about world events, not because I don't think that they are important, but because my writing focus has always thrived more in the everyday occurrences of an *extremely average* person - me. I relate so much when other writers do this, and my enjoyment in writing comes from trying to do the same thing. I think that the simple things of a day-to-day existence of plugging away at ones job, parenting, cleaning the house, your hobbies, whatever - all of that can be profound to other people experiencing similar things and can be applied to more difficult situations when such things arise. And so I don't often focus on items in the news on this blog, but as you must imagine, I'm very aware of them. And lately...it's been tough. I'm writing this right now instead of working because I saw some things in my Twitter timeline that have made me cry and I can't focus on work. I have never been more aware of how lucky I am to have been born and live where I do. But why aren't other people so lucky? There are no answers, and it's a painful, painful thing to think about. They don't deserve what is happening to them, nobody deserves that. And I feel so powerless to do anything to help them. Let us ask for the intercession of St. Dominic for all of those who are suffering in our world. 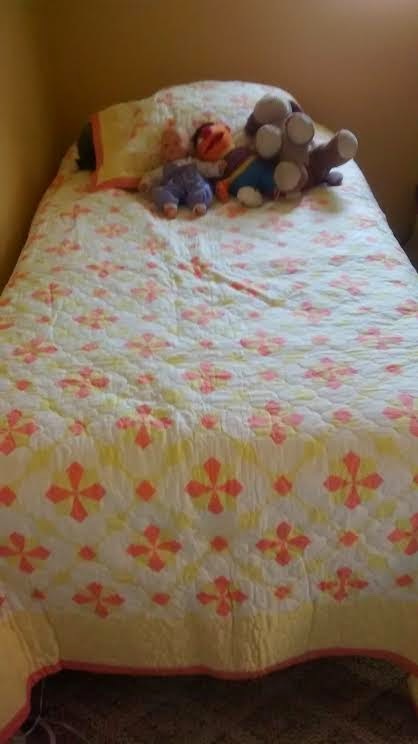 "I love my new bed Mommy! We need to stay in my room forever because I refuse to leave my bed, I love it so much!" "I hate my bed, Mommy. I'm not sleepy and I will NOT sleep in it!" -4- "Uh oh. It's that woman with the strange and vast amount of yarn in her carry-on again!" I officially have flight reservations to go to Maine this fall to visit my sister and twin nephews. Long time readers know what this means: I will whine about commercial airline travel from now until then. I am a fearful flyer. I have made a concerted effort to try and combat this, and it has in fact helped a tad. Meaning, I am now able to do it without contemplating muscle relaxers. But I still don't come anywhere near to enjoying it. I will load up my Kindle as a distraction, and this time I will also have my smartphone, so wait for the Tweets, y'all! Every airport has WIFI now, so watch out!! You'll be kept abreast of my every movement whether you like it or not. #ObnoxiousTweetsFrom30ThousandFeet - Coming your way this October! Oh, and Southwest's ease of alcohol purchase via your credit card? So blissful. I'm going to have Henry with me, just to keep things that much more interesting. ;-) We couldn't afford for us all to go, and couldn't commit the time (or stamina) for the 10 hour car ride, so flying it was. His birthday is in November, and we thought this would be a nice gift for him. He's super excited. It's just adding to my anxiety to leave Mike and my Honeygirl Anne behind. :( Very worried about this, but it's only for a long weekend, so please put me out of my misery by telling me to get over it and move on to take #5, yes? -5- "Maybe if I just *squish! * the starfish inward the button will slip right in!!" 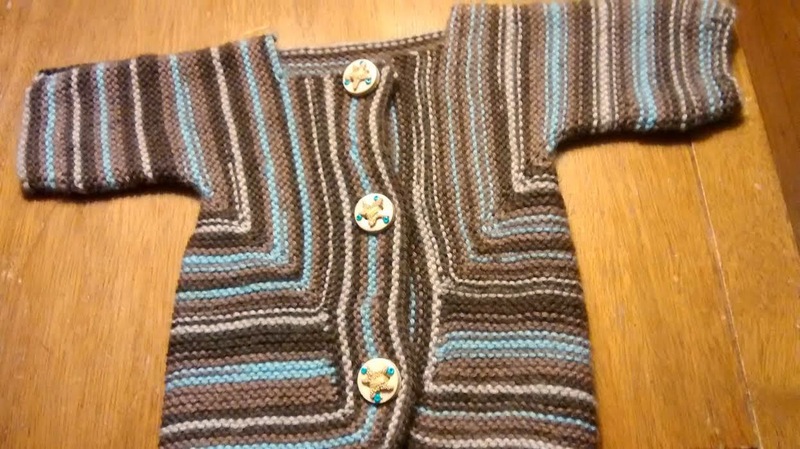 I have finished the baby cardigan I am knitting for Sheila and baby, ta da! "Tiffany, you are SUCH AN IDIOT!!" That's what I said to myself (a frequent occurrence when I'm working on crafts) as I realized that the buttons I purchased were *somewhat too large* for the buttonholes I'd created. Meaning WAY too large. Last night found me creatively "stretching" the buttonholes and that worked a bit. But poor Shelia is still going to encounter grabby starfish whenever she goes to button the baby's cardigan and that just doesn't seem like a problem I want the mom of a newborn to have to worry about. So I'm going to try making the buttonholes bigger. If this goes poorly, you will soon know about it, rest assured. :0 With lots of asterisks disguising swear-like words just for good measure. -6-Ice cream and world dance, what could be better? 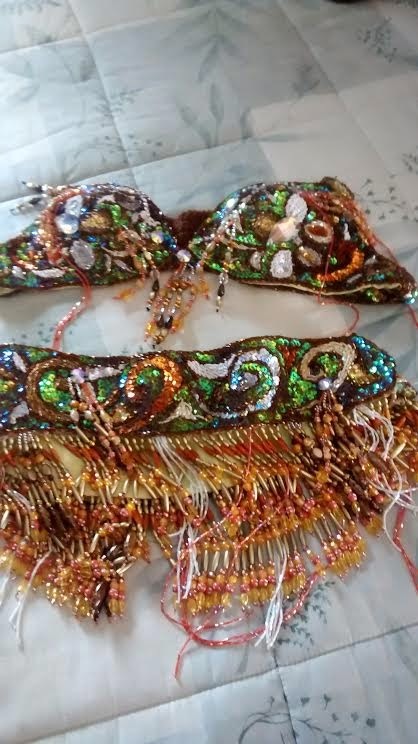 -7- As promised, dance costume photos! Certainly not a perfect match, but I didn't expect I'd be able to do that anyway. 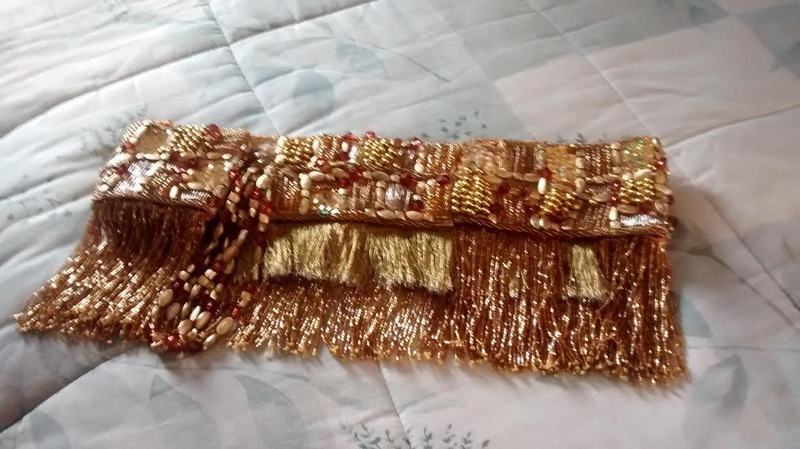 I just didn't want it to look so obvious that the belt was bald in spots. I think it turned out pretty decent, I'm happy with it. I love it. A lot. I hope that you all have a delightful weekend! I'll be with you again on Monday with a dance post, so if you enjoy those, be sure to tune in. 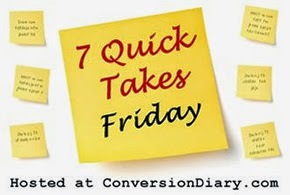 And check out Conversion Diary for more 7 Quick Takes! 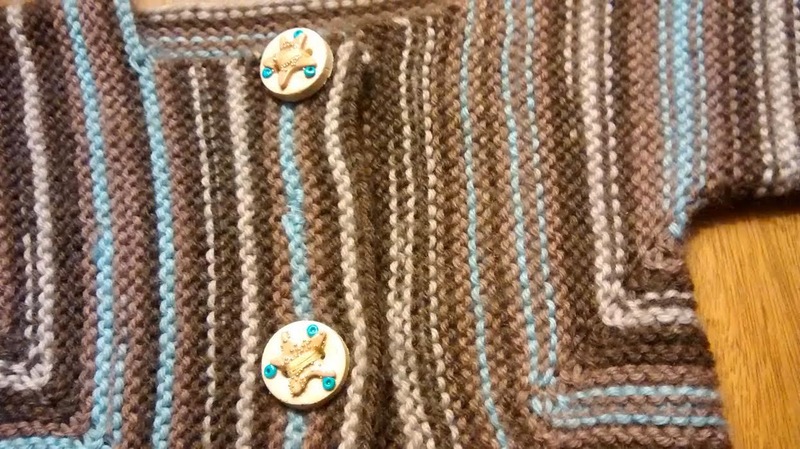 I didn't know it was possible to make knitted buttonholes bigger. If you can't, don't worry about it -- I am very talented with buttons and squirmy babies!